Earlier this week, Reuters/Ipsos reported that its generic "How Will You Vote?" poll ahead of November's mid-term elections had swung into Republicans' favor for the first time this year, erasing a double-digit lead Democrats had just four weeks ago. This kind of movement would certainly be news at the Associated Press, The New York Times, the "big three" networks, and other so-called mainstream media outlets if a strong GOP lead were to disappear so quickly. But as of Thursday afternoon, while scores of center-right blogs and news outlets noticed this seismic change, only a precious few less-than-major establishment press outlets had. 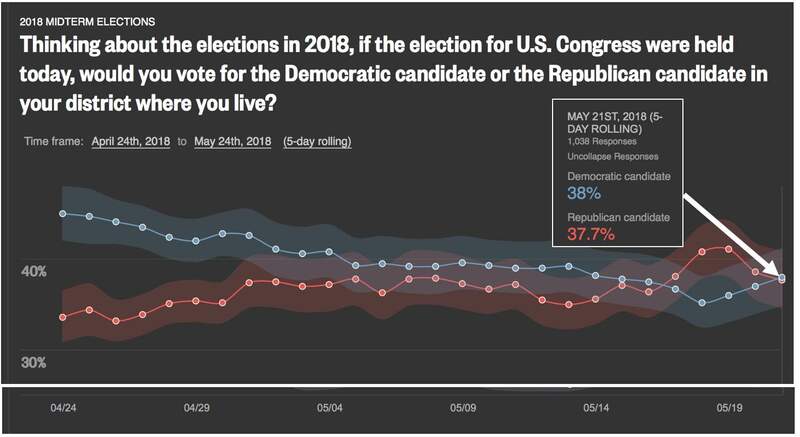 The Hill covered the story on Tuesday, noting that "The results are a stark contrast to previous polls, which showed Democrats with a 10-point edge as of late April," and that "the Reuters poll reflects a larger trend of Republicans closing the gap in the generic ballot." Newsweek's Marie Solis has a strange definition of "losing its midterm advantage." Though it's still 5-1/2 months before Election Day 2018, her reported numbers show that the Dems have lost their advantage. Forget about finding Reuters-specific data at the New York Times or the Associated Press — or at an actual Reuters story. The Times at least had a Wednesday item by Russ Douthat referring to the Dems' "steadily shrinking generic ballot lead." Last week, Americans heard the Democratic Party's elected representatives and key figures defend the monstrous terror group Hamas, fight to recognize the "humanity" of the barbarous MS-13, and claim that a spy dispatched to the Trump campaign was in fact an "informant" who was "protecting" Trump from Russia. Apparently none of this appealed to voters -- and they immediately responded. Steinberg's contentions, combined with a consistently improving economy, are quite plausible — as is the idea that the establishment press isn't particularly interested in recognizing the momentum swing reported by Reuters. If they did, they'd have to tell their readers why it's happening, which is a prospect they apparently can't stomach.